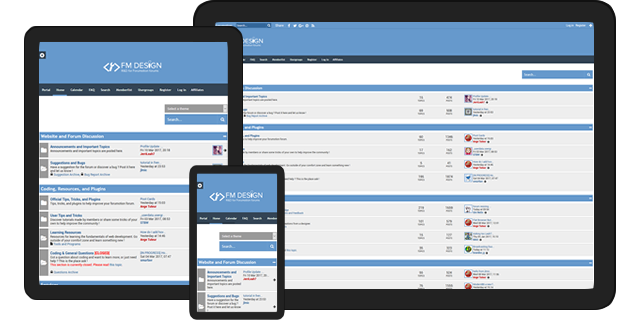 Forumactif Edge is a modern mobile-friendly theme built by the community of Forumotion. Created with the mindset of one version for all devices. Browse and chat on any device, from anywhere, at anytime, without any hassle. Flat and spacious design that's easy on the eyes and fits any screen. For the free forum service, Forumotion. Forumactif Edge is full-featured, right out of the box. Providing you with a handful of plugins for everyday foruming. Widgets are stored in a side menu that's always at your finger tips. Giving you easier accessibility and a more spacious forum. The navbar follows you as you scroll, so you never have to scroll back to the top of the page. Change the theme on the fly with our theme selector, that allows your members to change the color of the forum to the one they prefer! Turn the lights off for some late night browsing, and make things easier on your eyes. Dark Mode gives your members the power to change the lightness of the forum! Like or Dislike posts without ever having to change the page. You can also see how many votes a post received! Posts are colored based on the usergroup a member belongs to, making it easier to know what group they're in. Forumactif Edge provides you with both a dark and light theme, along with a plethora of colors to choose from, giving you the ability to truly personalize your forum. Choose from a professional light theme, or a sophisticated dark theme. Two designs to match any taste! Choose from hundreds of different colors or create your own. Import an editable stylesheet and personalize it however you like. Plus all edited templates are at your finger tips! Themes support a right-to-left version, which makes Forumactif Edge a perfect choice for rtl scripts. Forumactif Edge comes with a smart automated control panel that helps you with installation and other everyday tasks, making installation and customization a breeze. Our Smart Control Panel helps you Install or Uninstall Forumactif Edge, without you having to ever lift a finger. When a new version of Forumactif Edge is available on Github, our Smart Control Panel will notify you and help you install the latest release. You can change the language of Forumactif Edge at any time. Just select the language, click "Change Language", and the Control Panel does the rest! Changing the forum width, themes, etc.. is a breeze with our Smart Control Panel. Just select your preferred settings, save, and you're done! Forumactif Edge supports multiple languages, allowing you to browse in your native tongue. Forumactif Edge can be translated into multiple languages, and language support is ever-growing thanks to people like you! If your language is not available, you can make it available! All you need is an internet connection and a Github or forum account. Forumactif Edge is open source, that means anyone can contribute and improve this ever-evolving theme. This project is built and shaped by people like yourself. We're always looking for suggestions and help to improve Forumactif Edge. There are plenty of ways you can help improve and contribute to the Forumactif Edge project! Forumactif Edge is not an official product of Forumotion.